I came around this funny video which I haven't seen before and I think you all will enjoy it. It's an extension of the video we saw earlier this year, from Empire magazine, and we see Dan thinking more about this "one word" they need to say plus extra scenes of the other actors too. Courtesy of sarahdunn.com. Another photo from the photoshoot. Here's another one on Facebook. And now to other videos I also had never seen this one before. 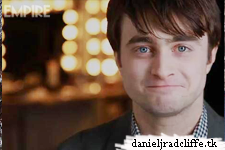 (cast talking about Mark at the Movies, during Deathly Hallows part 1, is also added to Daniel-Other things Dan related) + Dan's Christmas message (an old one, but in time for this year ;) & Cast thanks the fans (Deathly Hallows part 2) see those below. Dan: "They do things by heart and I thank and salute them all"